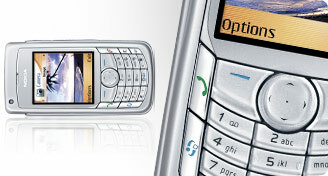 Cingular Wireless is set to launch the Nokia 6682 (with it most likely replacing the aging 6620). 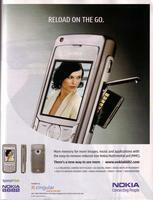 A print advertising campaign for the Nokia 6682 with the note, "Available at Cingular" has been launched. The image to the right is a scan of the ad from September's Wired Magazine. Additionally, Cingular has images of the 6682 on its web server than can be seen by knowing the exact URL (the images are not shown anywhere in the store but apparently are already loaded up for when the phone does launch). View the images: medium, showcase (these images are also located at the end of this article in case they disappear from the website). Features of the Nokia 6682 include: * Series 60 with Symbian 8 * 1.3 megapixel camera * RS-MMC slot Pricing is not known, but the existing 6620 sells for $199 after contract. MobileTracker is currently in the process of reviewing the 6682, stay tuned. 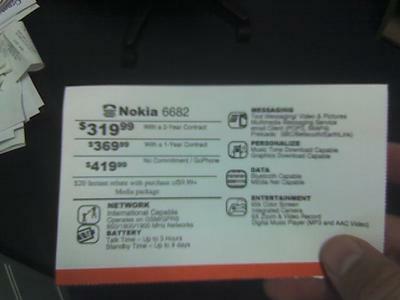 UPDATE: MobileTracker reader Michael sent in a photo that shows Cingular's pricing for the Nokia 6682. $319.99 with a 2-year contract. The image is available below.